What do you get for Star Wars fans who have more lightsabers and Darth Vader masks than they can handle? 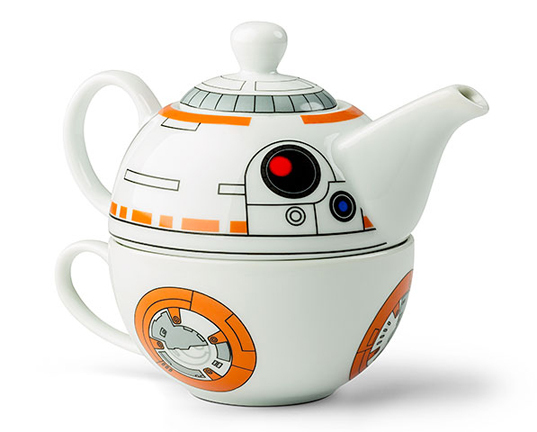 How about a BB-8 tea set so that they can invite friends over for some chamomile or rooibos chai while discussing the rebel takeover? The Star Wars: The Force Awakens-themed 12 ounce tea pot and 6 ounce cup set, which nestle together compactly to resemble the newest and most charming droid in this galaxy and beyond, is made from ceramic and is dishwasher and microwave safe. The tea set plays on BB-8’s natural shape and encourages a fun and slightly more refined activity than trying to zap each other into oblivion with lightsaber battles… although there’s plenty of time for that too — once the tea and some scones have been enjoyed. Even grown-up Jedi may also imbibe their favorite beverage from BB-8 as part of their supergalactic morning tea ritual. Get one, we must. What do you get for Star Wars fans who have more lightsabers and Darth Vader masks than they can handle? How about a BB-8 tea set so that they can invite friends over for some chamomile or rooibos chai while discussing the rebel takeover? The Star Wars: The Force Awakens-themed 12 ounce tea pot and 6 ounce cup set, which nestle together compactly to resemble the newest and most charming�droid in this galaxy and beyond, is made from ceramic and is dishwasher and microwave safe. The tea set plays on BB-8's natural shape and encourages a fun and slightly more refined activity than trying to zap each other into oblivion with lightsaber battles... although there's plenty of time for that too -- once the tea and some scones have been enjoyed. Even grown-up Jedi may also imbibe their favorite beverage from BB-8 as part of their supergalactic morning tea ritual. Get one, we must.